This soap is a proven best seller at shows and markets! The soap uses Oatmeal, Milk & Honey Fragrance Oil, which appeals to many and contains oats for exfoliating properties. The finished bar has a natural feel that is complemented well with tied raffia. You Save $24.90 by purchasing this kit rather than buying the items separately. COMMENTS: Very easy to make. Smells really good and very soothing. Kit made a few more the recipe says. "My gateway kit to soapmaking"
COMMENTS: I purchased this on a whim, first time making any type of soap...and I got hooked. The directions are easy to follow, soaps turn out beautiful, and of course the scent is heavenly. This was the kit that got me hooked on mp soap and then led to my addiction to making cp soap. Highly recommend buying this kit if you're wanting to make a simple, yet beautiful soap for the first time. "Simple to make, smells divine"
COMMENTS: I made this all at once. I used the mold that came with the kit and then poured the rest of the soap in a loaf mold. The slices from the loaf mold look even better than the shaped mold. You can see the cut oats in the slices and it looks really cool! COMMENTS: I recently made this soap, and it is a hit with me and with my customers. It's gentle yet effective. The scent is evident but not overpowering. Some have said it reminds them of Sunday mornings at home as a child. I'm thinking the scent would also be good in a candle! COMMENTS: This kit worked well and the soaps are lovely. Good directions. Soap is a creamy solid texture. Oatmeal additive makes interesting pattern and the scent is great. Highly recommended. Thanks WSP. This is a winner. • Can't think of any suggestion. COMMENTS: This kit has all you need to make these soothing oatmeal soaps. High quality mold and a big discount if you buy as a kit. I would recommend buying as a kit until you have all the molds you need. COMMENTS: I made this with my grandkids in mind, they have issues with their skin and they love the way their skin feels after using this soap, even the blemishes have eased up. I used a larger mold which produced fewer bars, but the kids like the feel of a large bar of soap. COMMENTS: I made these to give as gift's for our clients! Very easy and our clients love them! They smell clean and fresh! COMMENTS: We are a fairly new business, passed these out as gifts for a few people to try out and made over $100 in sales! Great Bars and the kit came with everything. • Great for first tiNme soap makers! • Great smell! We even had FO left over! • Not a thing! Customers loved the them! COMMENTS: This was my first time making soap ever and I must say it was an amazing experience. The instructions to these scrubby bars were simple to follow. There is more than enough MP soap to make plenty of soap. I took a shower and tried it out. Smelled great, the oats felt good against my skin. Soap had just the right amount of lather and I feel clean! Will purchase again. COMMENTS: I absolutely love this kit! Mine was actually missing the hair nets, but otherwise everything was included. The instructions were easy to follow, the scent is AMAZING! & the bars I made came out looking exactly like the picture. I love them! I'm not sure if the fragrance or the soap mold is my favorite part, as I was so excited about both. The bars are a slight bit smaller then I expected, but no one has complained & they last. I will continue buying the products in this kit separately & in the kit as well. COMMENTS: This was the first item I purchased from this company a year ago and it makes a great addition to my product line! Easy to make and easy to clean! This is one of my top sellers!!! COMMENTS: Love this soap kit. So easy to do. Great to learn how to make soap for the first time. COMMENTS: The soaps I made look exactly like the picture! 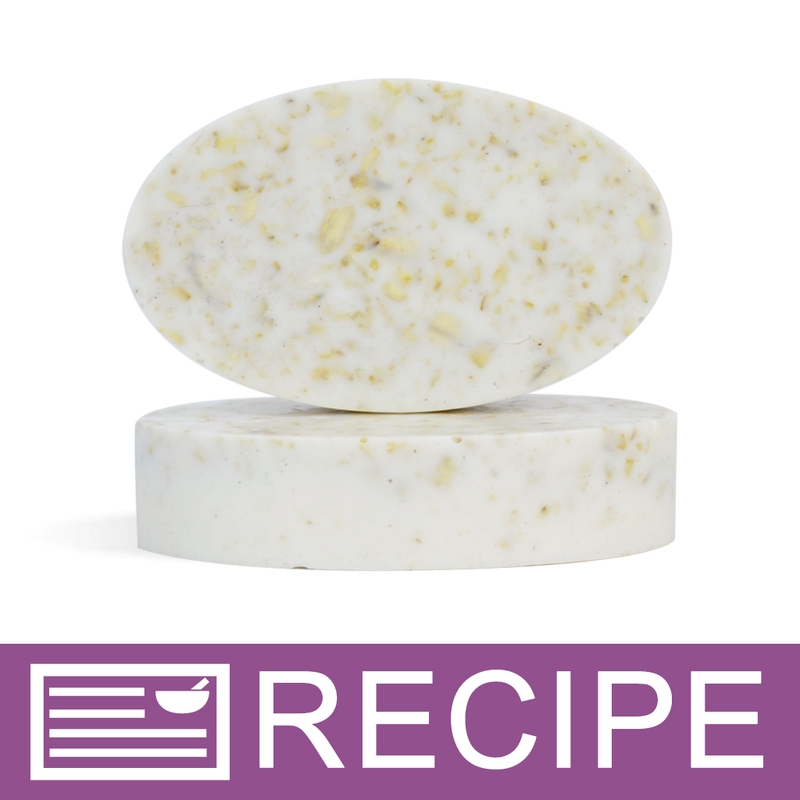 "Oatmeal Scrubby Soap Making Kit "
COMMENTS: I just love the Oatmeal Scrubby Soap Kit. Was very easy to make, and looks very pretty. COMMENTS: This kit was easy not complicated. My customers love this. It's a great sell, and wonderful smell. When my customers see this facial bar they think it's food. But, my repeat customers love it. I only wish we could get 2 molds with this kit to finish quickly. • Easy bar to hold. • Have at least 2 molds. COMMENTS: This soap is so easy to make yet it impresses everyone who sees it. The creamy lather coupled with the pulverized oatmeal and fragrance produces a soothing soap the entire family can enjoy. I've loved this soap from the first time I used it. It also keeps my hands from drying out, which happens all the time with the liquid soaps. I would highly recommend this for anyone who's wanting to make a quality soap for the first time. "This Soap Smells Good Enough to EAT!" COMMENTS: I liked everything about this kit. The instructions were easy to follow and makes a very pretty bar of soap. I have shared some with the ladies in my office and they all love it too! "Super easy for a "first time" soap maker!! " COMMENTS: I loved the easy to follow instructions and process of making this kit. Finished product looks pretty, smells fabulous, and was a hit with each recipient. My kit made a bit more than I expected so I enjoyed the soap also! COMMENTS: This is an absolute favorite for my customers! They use this on their face, body, and feet. The results of the exfoliation is unbelievable!! I use this on my face as well and my dry patches are no more!! Thank you WSP for this wonderful kit & recipe!! COMMENTS: WOW! That is really all I can say. Everyone that I have shared this soap with love it. They love the smell, size, and exfoliating feature. I followed the instructions that came with the kit and was amazed at the size of the bars. I actually got more bars from the kit then I was expecting. This soap also helps my skin feel softer. I am going to use this as my own soap as well as share it with others. Wonderful product and I highly recommend it! COMMENTS: Decided on these for gifts. So fun to make I had a blast! Easy to follow directions as this was my first time making soap, everyone's going to love them. Made a few more than the kit said I would so I tried one out yesterday and loved the feel of my skin afterwards! "I know this comes with molds and I do plan on using it. But if I pour it into a loaf mold would it still work?" Staff Answer Yes, you can use the same method to make this in a loaf mold. "Hi Can I use the oat without grinding? Doesn't it clog the bathroom sink?" Staff Answer The oatmeal should not clog the sink. Not much oatmeal actually comes off the soap when used so it should not be a problem. "what size box do I need for this "
Staff Answer These guest soaps measure 3" long, 1.75" wide and 0.75" deep. "I just made these and they look good! I used the instructions from WSP. Now I noticed the oatmeal, milk, and honey fragrance oil contains vanilla. The instructions did not include vanilla stabilizer. Do you think these soaps will discolor over time?" Staff Answer Hi Kathleen if a fragrance contains vanilla, it is recommended that you use a vanilla color stabilizer. Most products will turn brown. We have not noticed any discoloration with this Oatmeal Scrubby Recipe, but there are exceptions to everything. I would recommend making a small test batch without a stabilizer and letting it sit for at least 7 days. This will allow you to determine whether or not a stabilizer is required for that formula. "Hi. Can I add vit E? Thanks." Staff Answer Yes you can. You will need to test your final product to ensure optimal performance. Also be sure to adjust your ingredient label to reflect any changes to the original recipe. "Do I need to let the oatmeal scrubby soap cure before giving or using?" Staff Answer This soap is ready to use when it is hard. No curing needed!